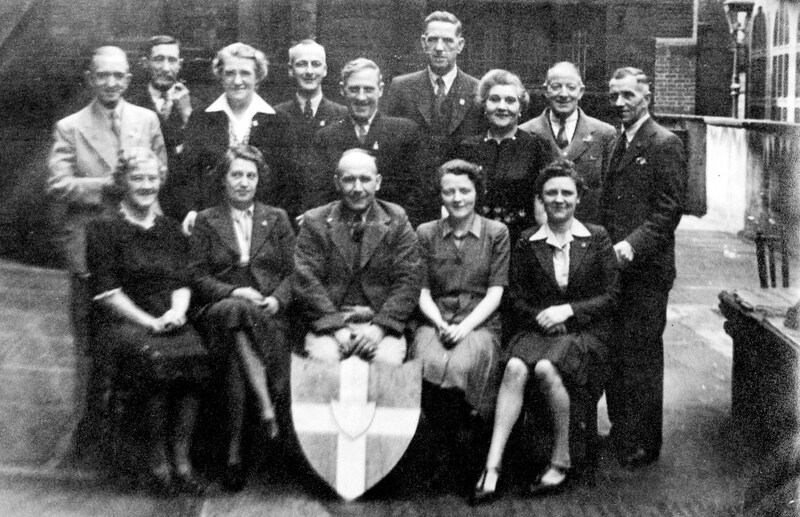 Just about finished an account of the Society and wondered if anyone knows anything about it? I could not find anything at the Local studies or Archives and therefore going to offer them my account, not very big but better than nothing. I only know of it because of my grandfathers involvement. They met at the Nether Congregational Chapel which I think was also called the Lower Chapel. Now the Central Reform Church. It was not one of the larger Societies and of course most returned home. the photo (below) was probably taken at the above and probably included the people listed. Mr C.A.U Rose Hon,Sec. (the one holding the shield?) lived at 121 Cemetery Rd. Hi Miked, I don't know if you are still posting but my Grandfather Herbert Ludlam was also on the committee. He is the man with the lighter coloured suit, first man on the left of the photo. I think the man on the far right is Jack Styles who was also on the committee and brother-in-law to Herbert. They were both married to Guernsey girls who moved to Sheffield between 1911 and 1913 with parents and siblings - The Maillards.